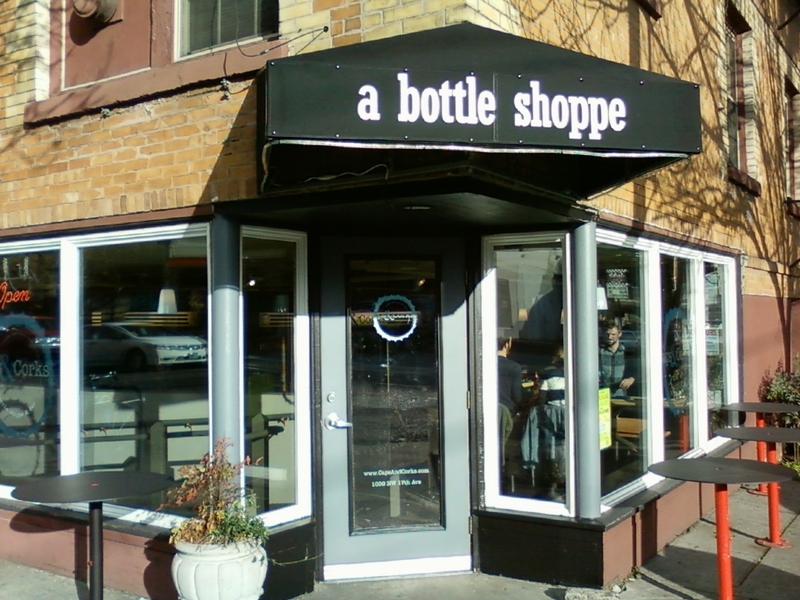 It's not often that I pick up a beer scoop around here, but the other day I stumbled on a newly opened bottleshop/taproom in NW Portland: Caps and Corks at 17th and Lovejoy. As Jason and Nicole pointed out last year, the NW quadrant is hurting for just such a business. The location had for years been the Emanon Cafe -- the name was "No Name" backwards -- but has started a rebranding this week. 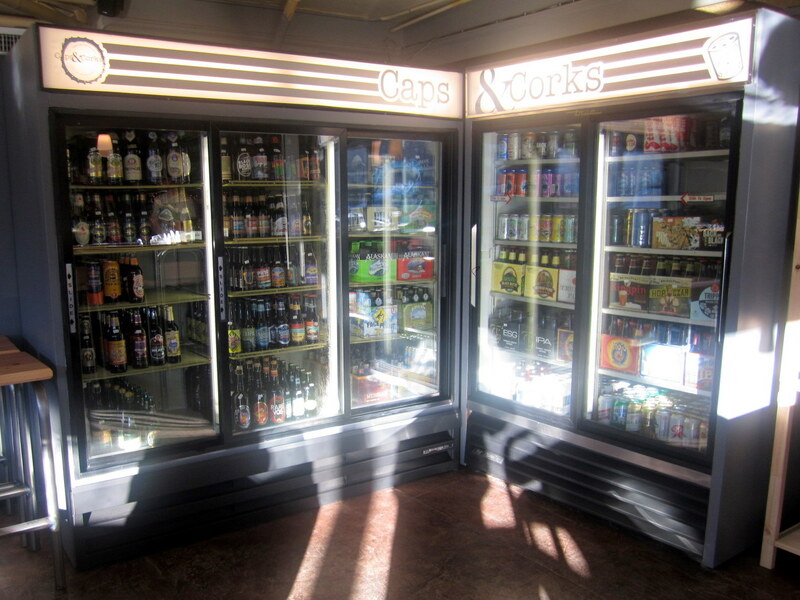 Beer and wine bottles are available to go: the corkage fee on beers is $1, whereas the price tag on a wine bottle is discounted by $5 if you get it to go. The bottled and canned beer selection had some interesting choices but will hopefully evolve further; I'm not a wine guy but the wine selection seemed a little paltry to me. They have a good selection of mainstream lagers in tall-boy cans if someone in your party can't drink the good stuff. Caps and Corks is a welcome addition to the neighborhood for me: it's kitty-corner from my office, and open for lunch. Most food items are in the $4-$10 range, and the menu includes such Portland favorites as poutine, house-made pickles, and meat and cheese boards. Nice to see the 20-ounce beer option at a reasonable enough price; in a perfect world every new beer bar in Portland would start off immediately using glassware with a marked fill line, but we're not there yet. There's quite a little tavern district popping up along NW 17th in the last year: the Bent Brick at Marshall, Moonshine Tavern mid-block, and now Caps and Corks at Lovejoy. Along 16th are some colorful bars that have been there a while: Slabtown (supposedly due to re-open soon), Le Happy, and my personal favorite dive bar in the area, Yur's. Caps and Corks is the only one to focus heavily on beer, let's wish them luck. They're already open for business, but they will have a Grand Opening celebration on January 27th. It figures that my old neighborhood would start blowing up after we left. The NW was definitely in need of a good taproom/bottle shop. I always liked that location and thought it would make for a good spot for such a business. Glad to see someone else agrees. NW seems to be having a bit of a moment with some exciting new tenants on NW 23rd (Salt & Straw, Bamboo Sushi etc...), Olympic Provisions, the new tavern district you mention, plus a few spots on NW 21st. Glad to see it but wish some of those spots had come in before we left. C'est la vie. Although I don't go to NW often (just can't deal with the nightmare that is parking) I was intrigued until I read about the corkage fee. I know Belmont Station does it, too, but it's a huge turn off for me. I hope to return sometime soon (with Sharon), so I'll remember to clue you in next time! I don't think that any bottle shop that has an on premise license doesn't charge a corkage fee, but may be wrong there. If they're selling their beer for standard retail prices, an added buck should still be far cheaper than what you'd pay in a bar--especially for 22oz bottles. @msubulldog: I'm right next to C&C, so if you're over there give me a shout, I can be there in 5 minutes. @Jason: Beermongers famously doesn't charge a corkage fee. Also pretty sure Hop & Vine doesn't, though maybe Saraveza does? Thanks for the update on this new joint. I too don't often get over that way just because of the drive, and parking, but i am sure it will be a favorite to the locals and folks working over there. Hope they flourish. Thanks for the post. You're right, Bill. Beermongers doesn't and Saraveza doesn't. I can't vouch for Hop & Vine, having not been there.